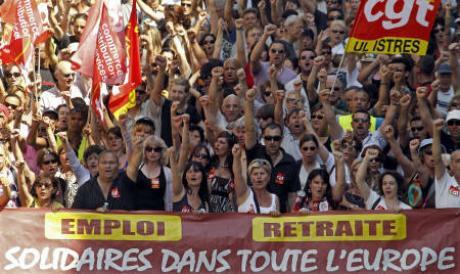 Right across Europe public sector pensions are in crisis. For years, successive governments have made outlandish pension promises to their employees that their taxpayers were never ever going to be able to afford. And the chickens are now well and truly coming home to roost. This morning sees the publication of an excellent new report on our own crisis. The Public Sector Pensions Commission (PSPC) confirms the harsh reality - public sector pensions are far too expensive and we simply can't afford to continue with them on the current basis. First, debt. As we've blogged many times, the vast majority of public sector pensions are unfunded - ie there are no assets to back the liability, which therefore represents a pure debt we owe to public pensioners. As we can see, Towers Watson - one of the world's leading independent actuarial firms - now put the true debt at an eye-watering £1.2 trillion, or £45000 per household. That's bad enough, but unfortunately the debt is still accumulating at an alarming rate. The best independent estimate (from Policy Exchange) says that the annual cost of the pension entitlement being accrued by current public employees is running at £34bn pa (2007-08). True, that's partly offset by the annual payments to existing pensioners (which reduce the outstanding liability), but shelling out £25bn pa on pensions is not what you'd really call comfort. The second point is that public sector pensions are now much better than those on offer in the private sector, and it simply isn't fair to expect hard-pressed workers in the private sector to pay higher taxes to featherbed public employees. Of course, the public sector unions and their supporters argue that these pensions form a perfectly fair and above board part of overall public sector remuneration. They say that they have accepted lower pay today against the promise of a better pension tomorrow. But the truth is that overall public sector pay is not low relative to private sector. As we blogged here all the mainstream public sector groups (including those famous teachers and nurses) currently do pretty well relative to the wider economy. And when it comes to pension provision, the public sector advantage is huge. In the private sector - even if you're one of the mere 11% now in a defined benefit pension scheme - the total benefit to you averages around 19% of salary (and you'll likely have to contribute to that). So the average policeman gets a total remuneration package that's 71% higher than what it says on his pay slip. No wonder we can't afford to employ them any more. Increase the pension age - most existing members of public sector schemes can still draw a pension at 60 (the police get it at 50, and firefighters at 55); with our vastly increased life expectancy, that has to increase. The choices are stark: either the pension age will have to be increased to around 80, or the accrual rate will have to fall from 1/60th of final salary for each year's service down to around 1/100th, or 1/80th if career averaging is introduced. But however stark the choices, and however much resistance the unions put up, change has to come. All sensible commentators are agreed on that. Labour had one fumbled attempt at reform. But with the unions as their paymaster, they were never going to push it through. As the PSPC points out, not only did they leave entitlement rules for existing employees untouched, even for new employees what they took away with one hand they gave back with the other. Their reforms were a flop, leaving taxpayers just as exposed as before. Mr Cameron has to do much better. He may have appointed John Hutton to take the initial flak, but it's Cameron himself who will have to push the reforms through to a final conclusion. Half-measures are not going to do it. To resolve this crisis he must steel himself for a long and difficult battle.